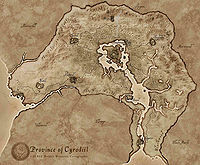 The Silver Road runs north to south from Bruma in the north to a point on the Red Ring Road due north of the Imperial City. For more information, see the Oblivion Silver Road article. This page was last modified on 31 July 2013, at 01:24.